“If I’m just a good listener, then I’m culturally competent.” It is a myth that good intentions and big hearts can make one culturally competent. The reality is, in order to provide the best care possible to Latino patients and their families, we must reach a higher level of self-awareness and a deeper understanding of other cultural perspectives. This new, self-paced course will give your team the understanding and tools they need to deliver the best care possible to this unique audience. Click HERE to get the Brochure on this course. If you notice you work hard to serve your Latino community but they’re not coming back or there is a noticeable friction you’d like to resolve, then this course is for you. If you’re concerned about non-compliance, staff morale, competitive advantages and liability considerations, then this course is for you. If you recognize that your team does not understand Latino health equity issues then this self-paced course is for you. The result is that you and your organization can better reach and serve your Latino patients. Use of palliative care by Latinos will increase because patients will be offered palliative care in ways that they understand and in ways that support their family and cultural values. Patients will become active participants in their care. Ultimately, health outcomes and quality of care will be improved. The first step is to raise the awareness within ourselves, then our team, and then our organization. Once we’ve raised our individual awareness then we can deepen our understanding of how others view the world. But without awareness, you don’t know what you don’t know. We cannot raise our cultural competency without raising our self-awareness. That’s where this course begins. Raising your own self-awareness. 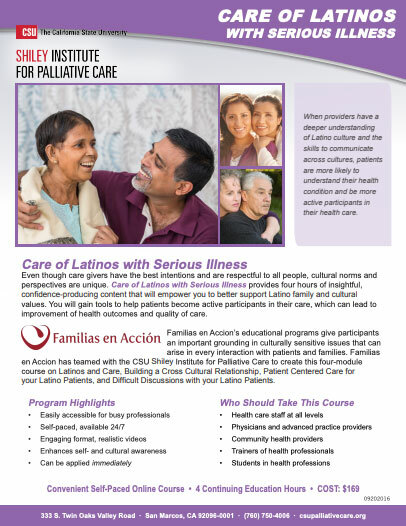 This course was developed by Familias en Acción, an agency that delivers cultural competence training for health professionals and health education for the Latino community. 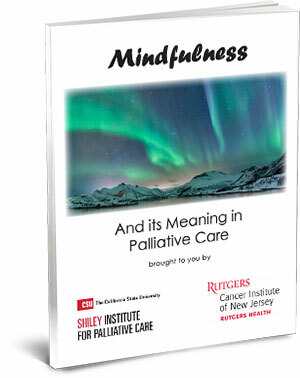 This self-paced online course gives participants an important grounding in culturally sensitive issues that can arise in every interaction with patients and families served by hospice and palliative care. The result? Patients and families can be offered palliative care in ways that they understand and that support their family and cultural values. This understanding will help you and your organization do a better job of reaching all those who need your care. Beatriz C. Nieto, R.N., Ph.D.
Unrecognized cultural differences do cause problems. A misunderstanding of the spoken or written word may be rooted in cultural differences. How the health care professional communicates with family members or deals with spiritual beliefs may be resolved by understanding fundamental cultural differences. Although this course focuses on the Latino and Hispanic patient and family, the principles learned can be easily applied to other cultures. Recognize potential benefits to both patients and providers by providing culturally competent care.